With the DiscoHAT you can control DMX equipment and LED strips. It also has interfaces for up to 8 pushbuttons that can be configured to start light and sound sequences. It is programmable in python. PiZero is the cheapest Raspberry Pi that came on the cover of the MagPi magazine. It is also available for 5€ so it is a very nice and capable processor for controlling lights and sounds. The PiZero has no Ethernet socket on board and no 3.5mm headphone socket. These missing features were a bit problematic for developing and testing applications for PiZero. The solution was to build Miscap to get the Missing Capabilities for PiZero. As the DiscoCap needs the SPI0 for controlling RGP panels I decided to add switches for moving the Ethernet to use the secondary SPI1 bus. 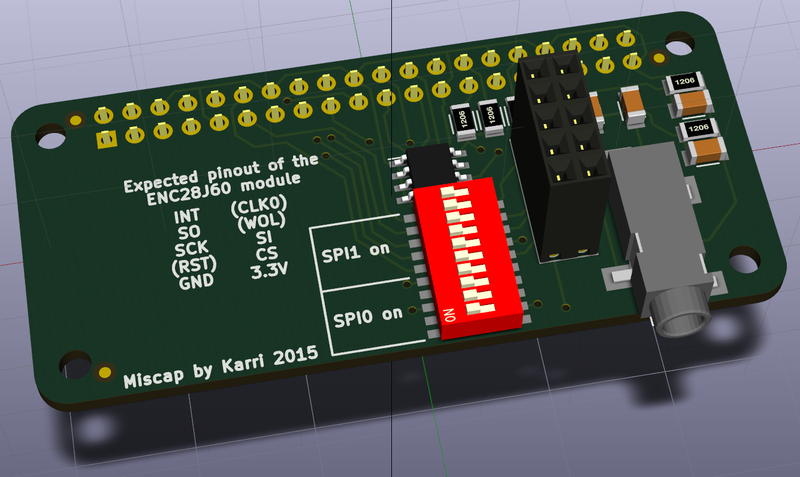 On the other hand the standard Raspbian OS has support for the ENC28j60 module when it sits on SPI0. That is why there is DIP switches on the card to support both. Miscap also has an eeprom on board. Normally the eeprom is not important. But when you want to use the SPI1 bus together with DiscoCap then the eeprom can be used to set up the Device Tree in the Linux kernel. This should provide plug-and-play functionality of the Miscap/DiscoCap combo. As a side note: DiscoCap had too little board area for the eeprom. So it is not HAT compliant by itself. 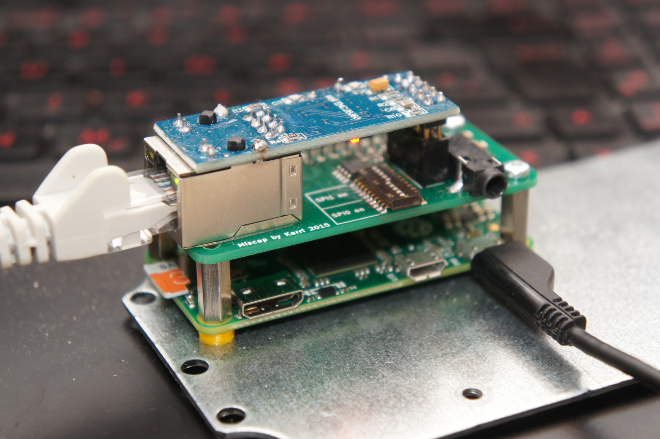 You can use Miscap on its own just to get Ethernet and headphones to your PiZero. Here is the schematics of the board. The protecting diodes for the headphone audio is missing in the proto series. I may also move the chip selects to other pins later. The ENC28J60 comes in different setups. The module I managed to buy from ebay is a bit too wide so it goes over one screw as seen here. I found out the if you put in the screw and bend the module a bit then the Ethernet goes perfectly in the middle of the board. The forces of bending it a bit are very small so I assume that it does not harm the setup. The current Raspbian has a very cool support that lets add on hardware configure itself automatically. Miscap has two special features. One is SPI based enc28j60 Ethernet controller and the other is PWM audio to non-standards pins. In the "old" system this required editing /boot/config.txt and issuing commands by wiringPi to change the use of the audio pins. This is now history. All the stuff described below is already programmed into your Miscap. This is here if you have a desire to change things. For normal operations you have to do nothing. The Ethernet and the audio just works automatically when you plug it into PiZero. If you want/need to change something I have added instructions of how to create the eeprom blob below. And also how to program the eeprom in Miscap. You need some tools and data files for working with Miscap. The first thing when creating a Device tree is to make the DTS file. This was created by adun, one of my first beta testers. Thank you! It is very well written and functional. firmware and dt-blobs that hopefully will find a good solution. Once the Miscap-overlay.dts file is ready you need to compile it to binary form. After this the next step is to prepare the information blob to the eeprom. The next step is to combine the miscap-settings.txt with the miscap-overlay.dtb into a file that can be flashed to the eeprom. After all these steps we end up with miscap.eep (http://discohat.com/data/documents/miscap.eep) that cam be flashed to the Miscap eeprom. I usually want to erase the eeprom first. In order to do this I create a file containing nothing and burn that first. After this everything is programmed into Miscap and you can just reboot to enjoy sound and Ethernet. One handy way to test the audio on the headphone jack is to use omxplayer. © 2014. Kertatuote Oy. All Rights Reserved.